How do children learn language? 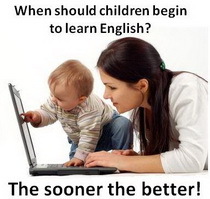 At what age shall they start learning English? Very simple: they listen, remember, repeat. It’s quite simple. They listen, remember, try to repeat and finally start speaking. The more a child hears the speech around, the more people talk to a child, the more words he or she will remember. Children are very good in relating words to items or actions. It doesn’t matter for them how many words are used for the same object. They will sort it out without any difficulties. In the same way children learn grammar – they just remember how to say phrase correctly. No child will tell you why he or she is talking grammatically correct and what grammar rules he or she is using. They just copy whatever they have heard most frequently. Apparently, the more a child is exposed to listening to the language, the better he or she will remember it. 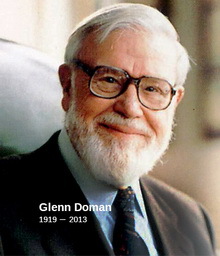 A well-known American doctor and developer of educational techniques for all children Glenn Doman (Doman’s method) and his team proved that education is most effective during the period of brain’s growth. That is why teaching to small children is much easier. Ability to master speech is inherent to a child since birth and is shown from the first months after birth. A child will speak multiple languages if parents arranged for him or her (artificially or naturally) multiple language environment. A friend of my colleague and her son went to Ukraine to visit her mother. A boy is four and a half years old. He speaks Russian to his grandmother. If he does not know or forgot any word in Russian, he tells it in English. If he does not remember that word in English, he will tell it in Arabic. In their family, the mother speaks Russian to him, the father speaks Arabic, the babysitter speaks English. By the age of 7, he will speak three languages quite fluently. A granddaughter of our close friend started school in New York. She lived in the USA for a long time, but in her family, they spoke Russian only. Of course, she watched cartoons in English, tried to communicate with neighbors’ kids a little; her mother spoke English to her occasionally but mostly it was Russian. For the first six months at school she was silent. A teacher accused parents of not sending their child to the kindergarten. They had serious problems. After 6 months, she started to talk. After 7 months, she has already started to show leadership skills among her classmates. By the end of the first grade, all problems had gone away. The end of this story is that at the age of 7 this girl is fluent in both English and Russian. What are the capabilities of a child’s brain? It is considered that a child can remember up to 20 words per day. A figure that is hard to check. Let’s divide it by half and then multiply by 6 years (1 to 7 years). 10 (words) x 360 (days) x 6 (years) = 21 600 words. Let’s assume that we divide these words between 2 languages. We get 10 000 words which a child is able to learn by age of 7 in one language and 10 000 words in another language. What do 10 000 words mean? This is an active vocabulary of a highly-educated person. Although, it is enough 4 000 active words for a fluent communication. Why a child doesn’t know that many words by the age of 7. There are two reasons. First reason is that he or she does not need them. A child will remember only those words that will be necessary for him or her. He will know a word “teleportation” and its meaning at the age of 5 from if he would watch a relevant cartoon. Second reason is that we don’t teach our children these words. After the age of 6, it becomes harder for a child to learn foreign languages. And still, there are two reasons. First reason is that the brain stops its intensive growth. Second reason is that by the age of six a child speaks his native language fluently. A child can freely communicate with people around him. And a unique ability to learn language that is given to a child by nature starts to get still, because main target of ensuring his or her survival in a community is already achieved.